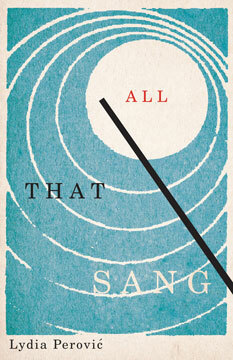 All That Sang - Lydia Perovi? Obsession, unrequited passions and the power of music. A visceral tale of obsession and creativity, unrequited passions and the power of music. A love story in which art is a foil to companionship, and the intellect an interlocutor of the heart. In the utterly unique All that Sang, the second fiction by Lambda Literary Award-finalist Lydia Perovi?, a Toronto opera critic on assignment in Paris falls in love with the subject she’s been sent to interview, France’s leading female conductor. But is the attention evenly matched, is genuine connection even possible? Perovi? guides us through the panorama that orbits contemporary courtship. The jilted lover, the housekeeper, the chiropractor, the manager, all take part in a chorus of voices that illustrate the unknowable creative spirit whose inaccessibility fires the writer’s obsession. Reminiscent of the bold and inventive fictions of Ali Smith and Siri Hustvedt, postmodern refractions play with the reader’s sense of perspective to build the persona of affection, a figure of reality and imagination that we all recognize but can never truly access. Lydia Perovi? is an arts journalist and freelance writer living in Toronto. She's written for n+1, The Believer, The Awl, the Globe and Mail, Opera Canada, C Magazine, Xtra!, Literary Mothers, and openDemocracy.org among others. Her first work of fiction, Incidental Music, was a Lambda Literary Foundation Award finalist for debut fiction in 2013. She blogs about opera on Definitely the Opera. 138 pp 8.5" x 5.5"